When discussing the already legendary Packers-Seahawks Monday Night Football scab-ref debacle yesterday, we wrote that the fiasco would be the public relations mess "that finally gets this deal done." How silly we were, thinking the NFL had a standard for public embarrassment. The league believes that the short-term pain of a football nation up in arms will be worth it two to four years down the road if they can improve the overall quality of officiating by adding what would be a taxi squad of three additional crews. In other words, it's likely that Goodell understands that solving the lockout by abandoning the demand for the extra officials would be a popular move today, but the NFL would still have what it considers the problem of not being able to replace underperforming officials. The NFL has been playing up the "we're just trying to make sure we get better officials later" card, but King later explains the primary reason for all this: pension plans. The league, in keeping with the current cost-cutting practice of corporations across America, no longer wants to guarantee how much each official would get in retirement, but rather tie the contributions to a 401(k)-type pension. That would save the league about $3.3 million per year. Now, there you have it. Leagues always say they're trying to increase "accountability" with their referees/umpires when they're trying to win a labor argument; it's their way of trying to appeal to the fans, to win the public debate. 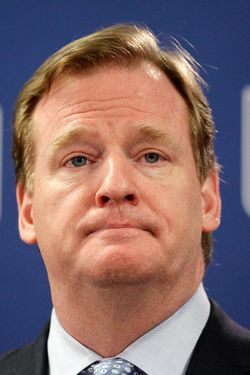 But even attempting that argument at this moment, at even thinking that the average NFL fan (or even the average person; the story has long since crossed over to the non-sports media) wants to hear that right now, shows just how lost in the woods NFL commissioner Roger Goodell is with this mess. This is as terrible and perilous a situation as the NFL has faced in years. Goodell and the league still don't seem to get that. If they don't get it after Monday night, and the now two days of outrage that followed ... you have to wonder if they ever will.